Those who like Ashokan Farewell, do they know it has an unusual chord in it that could cause trouble when playing it on a squeezebox (now speaking 2-row or less)? 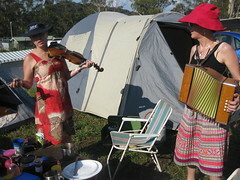 It is played regularly by melodeon players in sessions on D/G boxes with standard basses. It is easier if you cross the rows rather than staying on the D row for everything, and there is a need to work around the low notes if you don't have them, but it is all playable on a standard D/G with a little thought. How about Jesu Joy of Man's Desiring by JS Bach? Fits really well on box. Not sure where to find the abcs though! I would love to play this tune. ABC's Lester? Where did you hear the Midi ? I've only heard fiddle players on Youtube. Have lost my sympathetic Lady and looking again. Anyone ? Install ABC Navigator on your PC (it's FREE) and stick the ABC in and it will play it or use the ABC Convert-A-Matic. Suzi, I see TOTM as an opportunity to 'push my envelope' and make any such unusual chord part of my technique. OK I might have to fake it given the nature of the instrument. I don't feel we should pick tunes that need 3 rows, but I think 1-rowers will have to fend for themselves (and very well too, so far)! Could I be seconder for Ashokan Farewell please. Great tune and as you say, gets us into slightly newer territory. It's a nice tune indeed. I've never attempted to play it on the box, not for that Am chord but because I think it's nicer on the fiddle where you can do some hammer-ons and slides. But again, remember that I'm a beginner, I know you can do a lot of ornaments on the squeezebox, just that it's not in my world right now.. Here's the sheet music in abc, top line only. OK Lester. So where's the ABC then? This lets the cat out of the bag, sorry Bob. There's nothing to apologise for, tallship. I am grateful to you for transcribing the tune into ABC. I really love that 'Jesu, Joy of Man's Desiring'. I just converted the ABC and had a bit of a play on my C/F. This is a fantastic tune. I was surprised with how easy it is. Thank you. Another tune for my repertoire. Hec. Hi Hector - so true! I play it on the moothie - and it is surprisingly easy, as long as I can keep the breath control going.